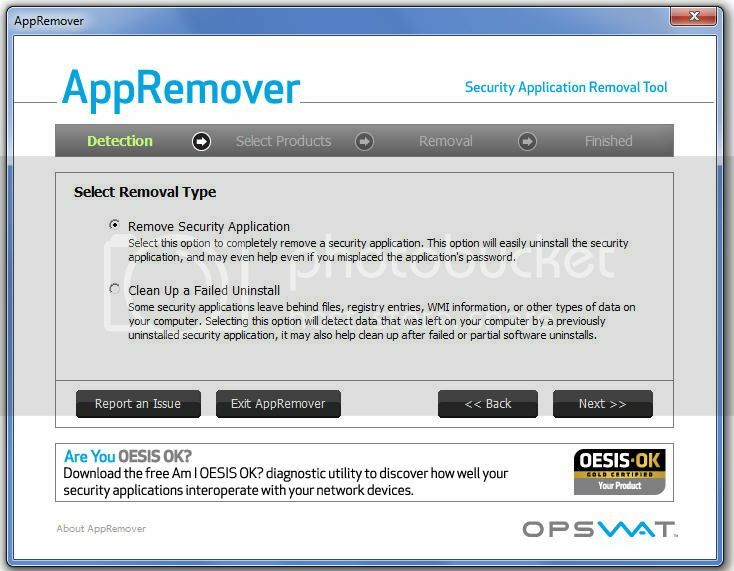 AppRemover is a software that allows you to remove an antivirus program or other security software completely from your computer. It is small, free and portable utility designed to be a single removal tool for a huge list of security products. It can remove products made by Avast!, AVG, Avira, BullGuard, CA, ClamWin, ESET, F-Secure, Kaspersky, Lavasoft, McAfee, Microsoft, Norman, Panda, Sophos, Symantec, TrendMicro, TrustPort, Webroot, etc. If a particular installation didn’t complete fully and you’re unable to remove it then AppRemover will get rid of it with ease. To run it simply download it from the below link and double click to launch it. It doesn’t require any installation. In four simple steps you can remove unwanted programs which don’t uninstall easily. On the first step you’ll get two options- To remove a security application, clean up a failed installation. To remove an antivirus program or other security software like firewall, anti spyware, etc select the first option. If you have partially complete installations that you want to remove use the second option. On the next screen you’ll be provided with the list of applications. Select the ones you want to remove. The process will take a while to complete. What is a Fake Antivirus, How to Prevent or Avoid it?